During the first two weeks of February, Easter Island transforms into one of the most magical cultural celebrations on the planet. Tapati Rapa Nui Festival, meaning 'Rapa Nui week,' is the most important — and largest — cultural celebration on Easter Island. The festival took root in 1968 with the goal of celebrating the unique culture of the Rapa Nui and to teach and promote their traditions to the next generation. As the most remote inhabited island in the world, Easter Island and the Rapa Nui people have an air of mystery around their storied history. Easter Island is a Chilean island located in the Pacific Ocean. Easter Island is famous for moai, monolithic stone heads dating back to 1250 to 1500 A.D. The mystery of how more than 900 statues were transported and created by the native Polynesians at the time persists to this day — it all adds to the magic that is Easter Island. During Tapati, the unique Rapa Nui culture is on full display. During the two weeks of competition, revelry, and feasting, visitors and locals alike bear witness to some of the most incredible competitions in the world. Here’s how it works: the island divides itself into two opposing (but friendly!) teams. Each team selects a 'queen' who acts as a team captain of sorts. For two weeks, the teams compete in a number of culturally-inspired competitions to collect points. Whichever team has the most points at the end of the games gets to crown their queen as the official Queen of the Island for the year. But the real story here is the incredible competitions that take place during Tapati, providing a rare window into the Rapa Nui culture and life on Easter Island. Here are four Tapati competitions you need to know about. Takona challenges competitors to the ultimate body painting competition — but there’s a catch. Participants must create pigments through elements of nature, honoring Rapa Nui’s traditional art of storytelling through painting. Like many other cultures, the art of body painting is linked to Rapa Nui’s history and tells its own cultural story. For example, Takona was traditionally used by the Rapa Nui people to distinguish rank and class. The placement of one’s body painting and the art depicted conveyed information like job, marriage status, and nobility. During Tapati, competitors mix natural pigments and clay and present their art to judges by sharing the unique story that their Takona depicts. Ever dreamt of paddling through the lake of a volcanic crater in a boat made of tied reeds? Us either. That’s what makes this first leg of Tapati’s famous triathlon all the more impressive. Brave competitors sport traditional dress and body paint and race across the lake inside of the Rano Raraku volcanic crater, paddling their reed canoes to the finish line. Even more impressive? This is just the first race of three — the next two involve running with two giant bunches of bananas and then getting back in the lake, swimming across with the help of a traditional Polynesian float, also made of reeds. This competition is for the ladies! Mahute is a traditional plant that was used by the Polynesians to create costumes. As part of Tapati, women process the plant and craft typical Rapa Nui clothing and costume. Mahute bark is used to create capes and loincloth, which the men competing in the festival’s competitions then wear throughout the two weeks of games. Like all of the activities during Tapati, the woman who creates the winning costume will earn points for her team, bringing them one step closer to crowning their Queen. We saved the best for last. Tapati’s Haka Pei competition takes 12 men on a race down the side of the Cerro Pui hill — a 393-foot slope. And that’s not all: the competitors race down the slope on plantain trunks fashioned into sleds, wearing only a traditional loincloth. Competitors clock in at speeds as high as 43 MPH, and it’s one of the festival’s main attractions. Crowds gather at the foot of the hill, taking in the spectacle over picnics, community barbecues, watermelon tents, and live music. It’s the pinnacle of the festival, and the bravery and finesse of the competitors serve as a testament to the rich culture of the Rapa Nui people. There’s a long list of incredible things about Easter Island’s Tapati Rapa Nui Festival, but their warmth to visitors tops our list. 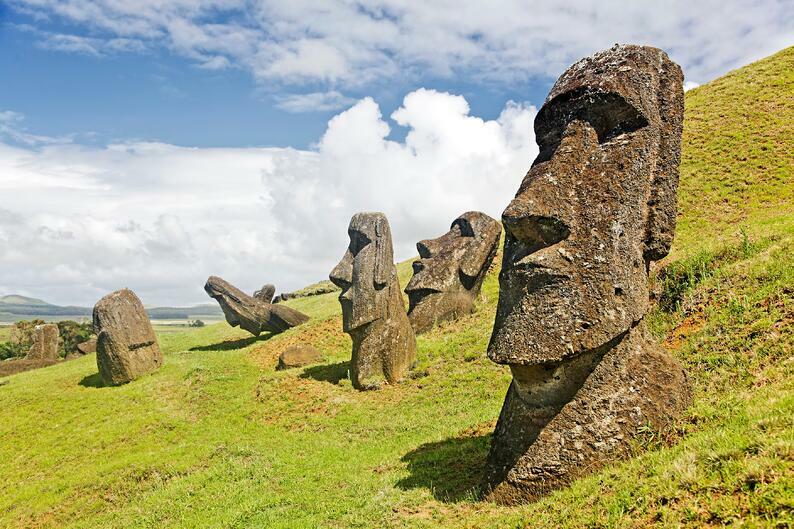 Because of the famed moai statues, the people of Eastern Island are accustomed to tourists. During Tapati, tourists are invited to join in on the fun, observing the competitions and celebrating with plenty of dancing, music, and great food. Ready to start prepping for your visit to this Chilean island? While many speak Rapa Nui, just as many people speak Spanish — and brushing up on your español means your language skills will take you that much further. Which of these four competitions would you most like to see? Share your top pick with us in the comments section below!